Warm November in much of USA kicking in? Agree....the players seem to have taken the field and settled into their winter home (or at least the first month of winter). With no massive changes in the pattern players in the short term..I think the November warmth will just extend right into December. Talking with Dennis, I checked Myrtle Beach a few times...and they seem to be a good example of what is going on at many NWS stations in the USA. Myrtle Beach is a good example as they are at the edge of the subtropics (which tend to be cooler in El Nino years) but north enough to feel some of the middle latitude/temperate climate controls, more that deep subtropical climates like New Orleans, Galveston, or Jacksonville. 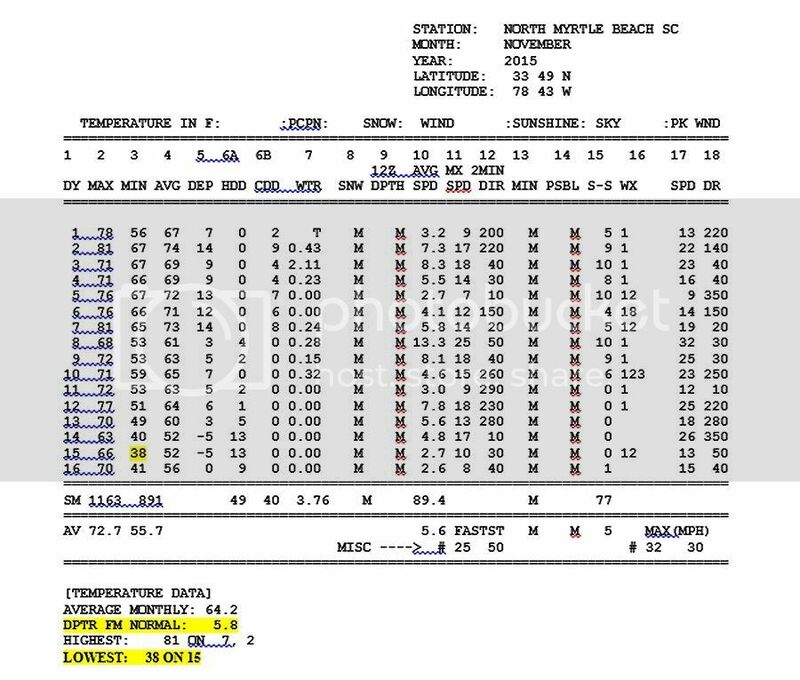 My guess (given the forecast for the next week)...there is now no way Myrtle Beach doesn't end November 2015 well above normal.